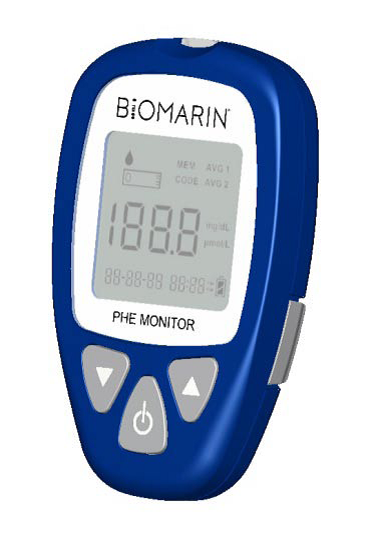 I am not sure how many of you are members of the PKU List Serv, but it was recently posted that Biomarin Pharmaceuticals has begun recruiting patients to trial the home phe monitoring device. This is definitely exciting news! Plenty of talk about this phe monitor has been tossed around in the PKU community for years, so it is nice to know that this idea is becoming a reality. If it wasn’t for the fact that the study is only being carried out in Hayward, California and York, Pennsylvania (both of which are miles and miles away from Wisconsin) I would definitely participate. To any of my friends who participate in this trial do me a favor and keep me updated lol ;). I do have one question to pose though: when we have this monitoring device how will we use it? Diabetic patients are able to utilize glucose meters effectively, because they know what to do when their blood level is out of range. When their blood glucose is high insulin is given. When the reading is low food is consumed to bring the level back up to normal range. What do we do then? Obviously if our levels come back low we know that we need to eat protein to bring that number back up, but how much protein do we eat? In another words, if my level is 1.5 mg/dl and I want to bring it up to 2.0 mg/dl how much phe will I need to eat to accomplish that? Also, when our levels are high how do we solve this problem since we do not have anything similar to insulin? Starve ourselves until it drops? Don’t get me wrong I am very grateful that these advancements are being made. I am sure they will be very useful in my life as well as my sisters and anyone else who has PKU. I am just becoming more and more curious about this new device, and with the curiosity comes tons of questions. Hopefully trials for the blood phe monitor will make its way to the good old dairy state soon. The information passed out on the list serv said you can contact Julia Choi at 510-441-4015/email jchoi@hanteltech.comor Leslie Shreiner at 800-706-0618/email lshreiner@conductivetech.com for more information or to participate in the study. that’s exciting news! I think you have a good point about knowing how to increase your phe. However, since you can supposedly test your level pretty easy whenever you want, you should be able to figure it out with some level of accuracy through trial and error. Ie — eat something & see if it raises your level too much. I wish I had that problem though — when my levels are low they are like a 3. I don’t know if I’ve ever had a level of 1.5!